Chemotherapy is poison, but in hands of skilled physician it can cure cancer. Similarly a martial artist trained to injure can use his art as medicine to heal. Aikido, like all martial arts, can and should be used to improve general health. Tai Chi, on the other hand, is the only martial art where health is a main thrust of the practice. For that reason, we normally suggest that when someone has a specific health issue, Tai Chi and Chi Gung are the best places to start. An interesting article in Time Magazine explains how Tai Chi is as good for you as Cross Fit. In fact, the health benefits of Tai Chi are well documented on many medical websites. Many times when the body is frail, starting with these forms are best to build strength. Then Aikido can add a whole new dimension, with aerobic / cardio vascular exercise in a relaxed state and extensive use of partner training for self defense. 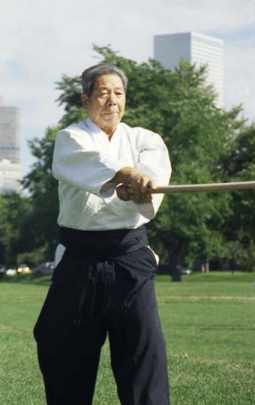 Aikido as a martial art does condition the body. For example, we build leg strength through knee walking, low stances and falling. Falling also improves cardio-vascular fitness as well as the core. Lastly, weapons training builds the arms. But mere physical conditioning is more the work of a gym membership than martial arts training. A critical aspect of exercise is the emphasis on relaxation and proper breathing. This approach leads to maximum efficiency. We already know how to operate with this efficiency, but we typically allow our mind interfere with the process and over-react. So the point of martial arts training is to teach one to inspect and let go of these exaggerated reactions. Then relaxation and proper breathing allows one to perform the task at hand with the maximum efficiency AND optimize health. However, one should note that the practice of Aikido is organized around self defense. The health aspects are a side benefit. If one has a specific health concern or wishes to learn more directly how the meridians of Chinese medicine operate, Tai Chi and QiGong (Chi Gung) would be the better martial arts for that purpose.